UDM Downloads > GdViewer Pro OCX - Image Viewer ActiveX! 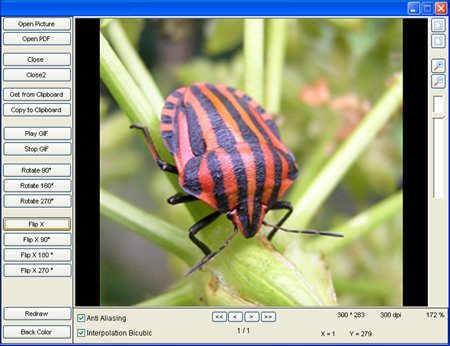 GdViewer Pro OCX is a High Quality Image Viewer ActiveX for .NET, vb6, Delphi, Access, RealBasic, C#, vfp, Windev and other that supports a lot of image format like bmp, dib, rle, tif, jpg, jpe, jfif, wmf, emf, gif, interlaced gif, fax, png, pnm, pcx... With Gdviewer Pro you can view vectorial and bitmap images, change the display quality or use the Automatic Quality mode, zoom, print, rotate and flip, scroll, zoom on area, pan, define display area, play animated gif, display multipages tiff image files, display pdf files (optional), use defined zoom in or zoom out values, use keyboard and mouse to scroll image, set anti-aliasing display mode, use built in options menu... Major features: - Multipage Tiff reading, you can change page easly - Multiple image scaling algorithms (Antialiasing, Bicubic and NearestNeighbor Interpolation ...) - Support lzw, ccitt3, ccitt4, rle and Jpeg compression - Support for 1bit, 4bits, 8bits, 16bits, 24bits, 32bits, 48bits and 64bits color depth images - Import / Export image from clipboard, HBitmap, IPicture, Byte array, Stream... - Advanced rotations 90, 180, 270, 360, Flip X, Flip Y - Flexible printing features with page autofit and custom position - Read exif tags, gps, thumbnails and extra tags - User define display area - Animated Gif Viewer - Advanced scrollbar with smooth scrolling - Aspect ratio and auto size control - Build in contextual menu including many tools like area selection, zoom and pan - Move the image manually (pan mode) - Zoom enhance, zoom by height, zoom by width, fit to viewer control kepping the original aspect ratio or not... - User define zoom and user define area zoom - Keyboard and Mouse Events - Change image zoom with mouse wheel - PDF Viewer (need an optional IsedQuickPDF license) - GdViewerCnt: Image viewer container class (like a vb picturebox, can contain other controls placed on it) - Royalty free distribution of the image viewer control and FREE UPDATES ! !